It’s time to clean out the potato bin in preparation for spring planting. 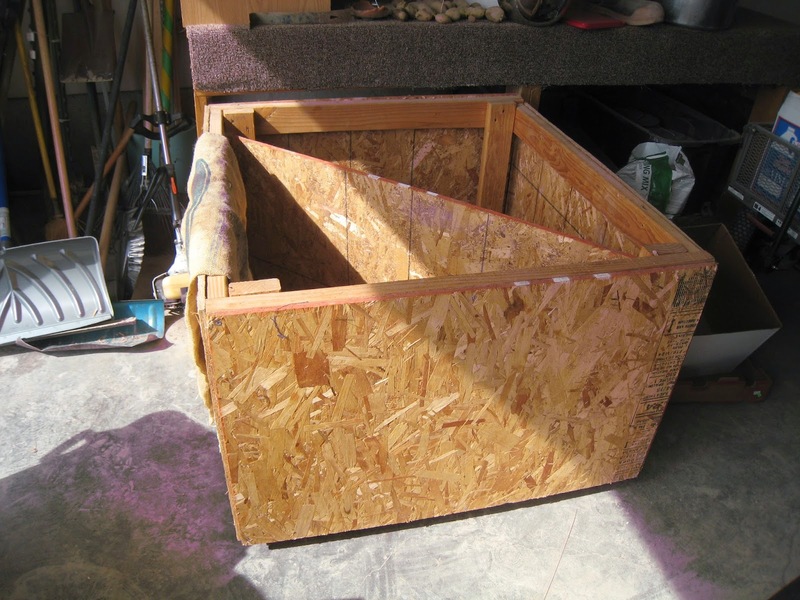 Several years ago, my husband made a big bin for potatoes and other veggies we harvest and keep for winter storage. The bin is about 3 feet high, 5 feet deep and 4 feet wide. It fits perfectly under the stairs in our garage. He put the bin on wheels so I could push the bin under the stairs so it’s more protected in the winter and it’s also out of the way of our family activities (like driving teenagers). He also split the bin in 1/2 so we could keep the stored veggies separate if we need to: potatoes in one side, squash/ cabbage on the other. We usually plant German Butterball, a Montana favorite, and a well-passed-down red potato I call “Reilly’s Reds”. 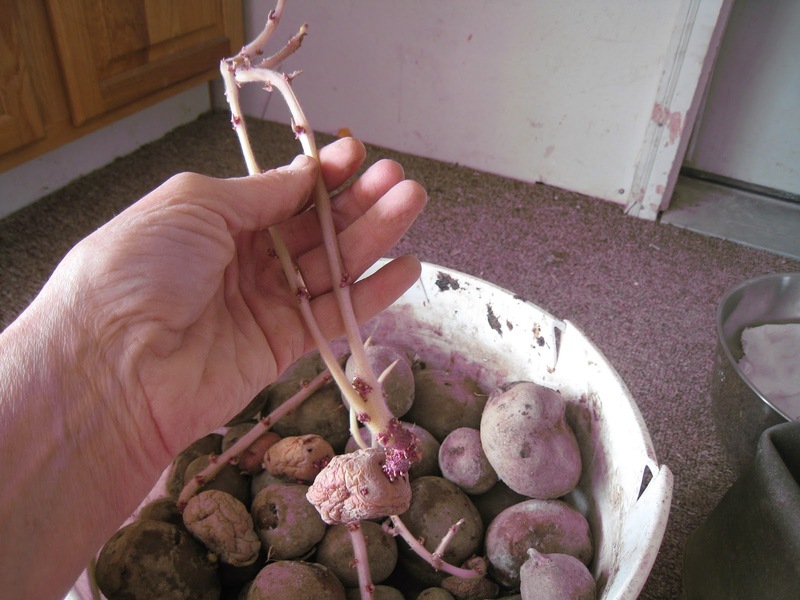 This red potato I named after the gentleman who successfully grew the same red potatoes he saved each season for over 50 years. Then he gifted me with some seed potatoes and we have been growing them ever since. Though Mr. Reilly died several years ago, I feel like we are carrying his tradition along in the potato he loved so much. We are also trying a new variety (to me) called Viking Purple. It’s supposed to store well and have a delicious taste and texture. This is what Gurney’s says about Viking Purple in their catalog: “Large spuds are superior all-purpose potatoes, but are especially delicious for baking. Once cut open, these uniquely colored potatoes reveal delicious creamy white flesh that is meaty and moist with a rich, slightly sweet and buttery flavor.” I purchased about 8 pounds at our local feed store for .99/ lb. As you can see, these potatoes are telling me that are already feeling the need to sprout and reach for the sun. But it’s still a bit early. These that have long shoots will not be used for the garden. If you look closely, the body of the potato is shriveled and dried. This is old seed. These sprouts are weak, and they will not produce a vigorous plant. Typically, plants from old seed will produce high tuber sets, but the plants lack the vigor to bulk the tubers to a desirable size. Young seed will have just a few eyes and therefore a low number of sprouts. A low stem number leads to a low tuber set. Larger, but fewer, tubers would be expected from young seed. Middle-aged seed will have multiple eyes. All the eyes on the potato could sprout. Middle-aged seed produces plants with multiple stems that lead to high tuber sets. Before cutting the seed potatoes, I go through the whole potato bin and cull out any stemmy potatoes and potatoes that are soft. 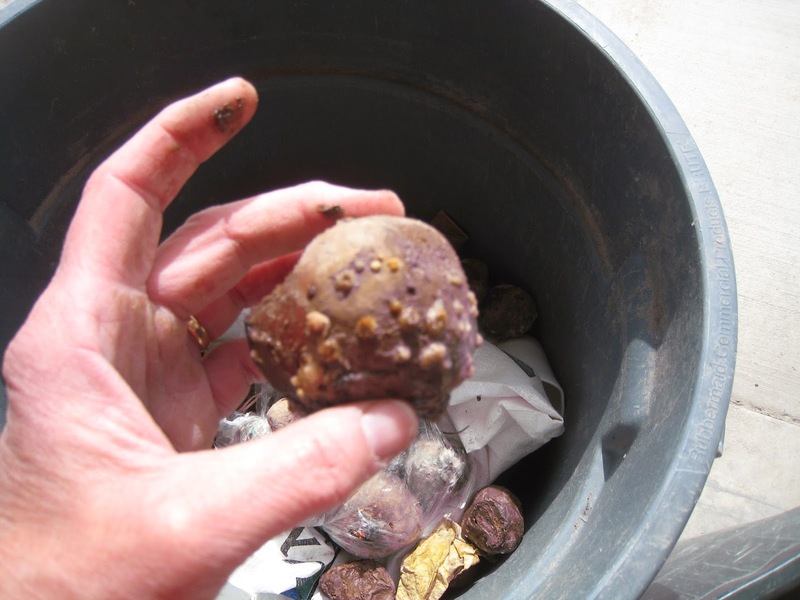 Sometimes I find a really wet potato that is all slimy and gross and ready for the garbage can instead of the garden. These usually smell bad too. I try and run through the potato bin a couple of times during the winter to cull out any potato that is beginning to rot so this won’t happen. But I obviously missed one. After all the potatoes have been separated into a garbage pile and a planting pile, I’ll cut the seed potatoes into pieces that have at least 2-3 eyes. But the cut potatoes need to be planted pretty quickly after cutting and should wait no more than 2 or so weeks before they must be planted or the harvest will be small. Since we are several weeks, if not months, from a planting date, the cutting will have to wait. But that’s ok. The separate piles are made and it’s just the waiting for warmer temperatures now.